Two adiabatic methods intelligently combined: the low-pressure molecular atomizer nozzle on the right and the patented evaporator unit made of high-quality ceramic on the left. At a height of 93 m, the ADAC building, which was opened in Munich’s Hansastraße in 2012, is an impressive architectural and technical achievement. On a total floor area of 129,500 m2, it offers space for 2,400 employees and boasts own radio and TV broadcasting studio, a conference center, an exhibition area, two data processing centers in the basement as well as its own printing press. Due to the special requirements, a hybrid air humidification from Condair was chosen for this building. Designed by Berlin-based architects Sauerbruch Hutton, the ADAC building features over one thousand windows in 22 colors due to partial screen printing of their surfaces and a colored glazing profile. This is why it quickly got the name “star from Sendling” (Stern von Sendling). The doubled-glazed façade ensures a supply of fresh air and, with internal blinds, protects the building from an increased irradiation from the sun and additionally prevents heat from building up. Alongside district heating and geothermal energy with heat pumps, concrete core activation was selected, together with natural ventilation, heat recovery and photovoltaics, linked with sophisticated building automation. 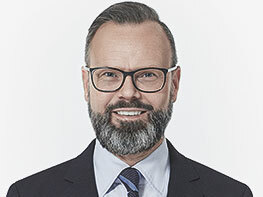 Keeping the ambient temperature and air humidity as constant as possible is absolutely essential for an optimal production process in the printing press, since otherwise serious disruptions can occur. These may include primarily paper distortion, i.e. changes to the dimensions of the paper, which hamper or prevent its further processing. In the process, the paper, which as is widely known consists of plant fibers and is hygroscopic, expels humidity into the ambient air. An additional major problem is posed by electrostatic charges due to excessively low air humidity, which leads to paper items (or other synthetic materials) sticking to each other and no longer running through the printing machines properly. The optimum equilibrium moisture content for paper processing is between 50 and 60% relative humidity. In computer centers, the relative supply air humidity has to be observed in conjunction with the cooling methods applied, but should generally be between 40 and 60%. Here also, a lower air humidity leads to electrostatic charging and damages. A high air humidity can lead to corrosion on the electrical/ electronic components. Of course, the comfort of the employees working in such areas of application must not be forgotten. The human comfort range is at temperatures of between 19 and 23°C and a relative ambient air humidity of between 40 and 60%. Correct air humidity also reduces the dust content in the air. A hybrid air humidifier uses two adiabatic air humidification methods. An atomizer unit and an evaporator unit are used in parallel to achieve a lasting combination solution to problems which would arise from using only one of these units. The evaporator unit consists of highly porous, highly resistant ceramic elements with a large inner surface. Molecular atomizing nozzles are distributed evenly over the entire surface of these elements. The nozzles are full cone nozzles which are supplied with deionized water coming from a small pressure booster pump which uses treated water (between 4 and 8 bar). (If a water treatment system with a frequency-modulated pump is already in use, the pressure booster pump can be omitted here if necessary). For reasons of hygiene, the humidification water is demineralized after it is softened, by means of a reverse osmosis unit. Effective, preventive disinfection of the water must also be carried out in order to effectively prevent microorganisms from spreading. The HygienePlus concept from Condair with its patented silver ionization system has proven to be an effective way to ensure hygiene quality over the long term. The electronic controller with automatic capacity monitoring ensures the exact dosage with constant disinfection action. The ceramic plates can be easily removed and cleaned using high-pressure cleaners (up to 30 bar). These are reusable over the life of the unit. The combination of atomization and vaporization allows for optimal use of the humidification water provided, and the resulting excess water quantity is very low and can thus be freely diverted for hygienic reasons among others. In order to prevent standing water, each spray circuit which is not active is automatically emptied via its corresponding spray valve. If the conductivity in the supply water is exceeded or if the humidification system has not been required for more than 23 hours, a flush valve opens and the demineralized water supply line as well as lines in the central unit are flushed with demineralized water for a given period of time. The Condair DUAL 2 used at the ADAC already holds the SGS Fresenius Hygiene Certificate and received an award from the German Federation of Institutions for Statutory Accident Insurance and Prevention (BG) for optimum hygiene and system safety. 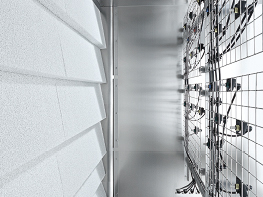 In the “Star from Sendling”, a total of 5 hybrid air humidifiers performing at between 4,000 m³/h and 24,000 m³/h have been reliably in operation since 2011, supplying the printing press and the computer center. 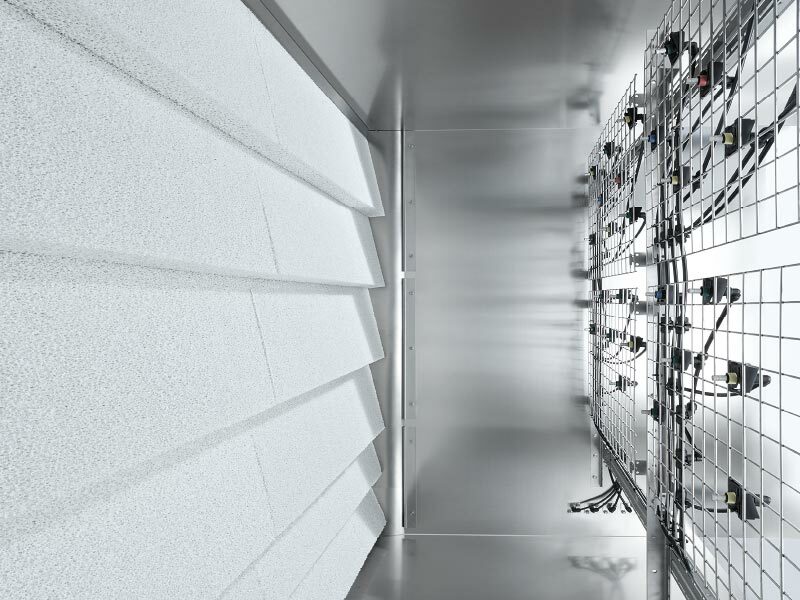 The planning of the ventilation technology was carried out by energy consultants NEK Beratende Ingenieure, the ventilation system manufacturer Huber + Ranner GmbH from Pocking was also commissioned and for the ventilation system engineering, the former company YIT Germany GmbH. 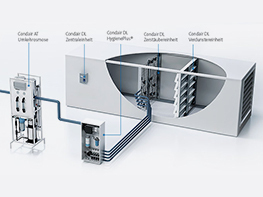 The air humidifiers were incorporated into the air handling unit of Huber + Ranner GmbH on the ADAC building site. Due to the high hygienic demand on the air humidification, the air humidifier installation is generally only carried out by Condair. In its operational state as per the layout, the power consumption amounts to only 155 W per hybrid air humidifier. 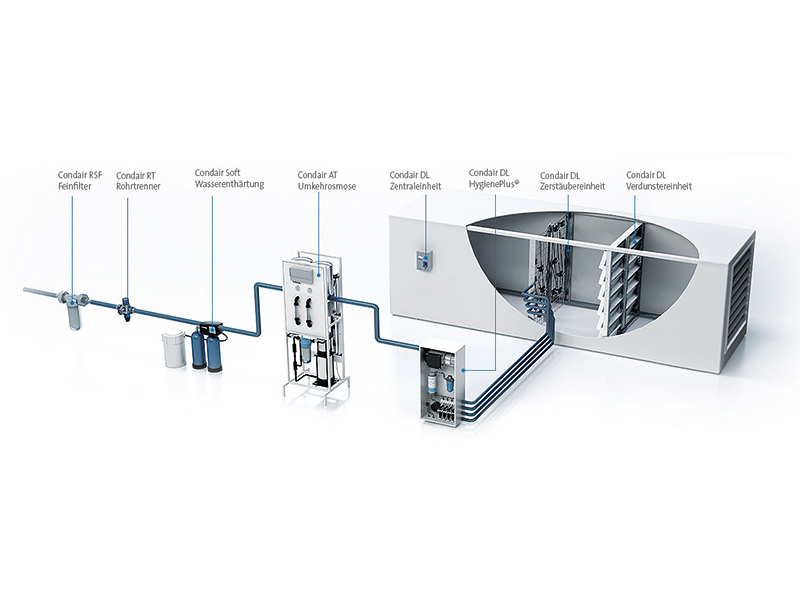 The experience gained from the ADAC project and others was incorporated into the enhancement of the Condair Dual 2, the most successful adiabatic humidification system ever. The result has been available in the Condair DL since 2014. The Condair DL was developed with regard to the highest possible levels of hygiene safety. Detailed structural solutions have a preventive effect, guarding against uncontrolled germ growth inside the entire air humidifier. The patented HygienePlus method provides for healthy air and a lasting hygienic environment. Its hygienic credentials have proven successful in practice and were verified and certified by independent organizations with public responsibility. With a minimum length of 600 mm, the new system has an even more compact design, which is mainly achieved through a full-surface layout of the vaporization ceramic and the new molecular atomizer nozzle with low pressure. Thus, the whole humidification chamber can be shortened, enabling noticeable material savings to be achieved.